There is a strong, persistent demand for well- trained IP lawyers in law firms, in-house legal departments, and government across a range of industries. Many of these firms, industries and agencies have roots in New Jersey or Manhattan. Seton Hall Law School has a long history of offering a wide array of IP courses, and created an IP concentration for J.D. students in 2000. In 2008, the Law School received acquiescence from the American Bar Association to establish an LLM degree in IP law. Seton Hall Law School now provides training beyond the J.D. degree to select students, practitioners and scholars in the growing and increasingly complex IP discipline. The Law School seeks to admit highly qualified candidates with a particular interest in IP law, including patent, trademark, copyright and technology law. All candidates must hold a J.D. degree from a law school that is approved by the Section of Legal Education of the American Bar Association or the foreign equivalent from a school of law. We seek candidates for the LLM program from among attorneys already practicing IP law who wish to increase their exposure to and credentials in the field; attorneys who wish to transition from other practice areas to IP; government officials and regulators who specialize or wish to specialize in IP related issues; and law school graduates who are interested in teaching or other academic or research work relating to IP law. 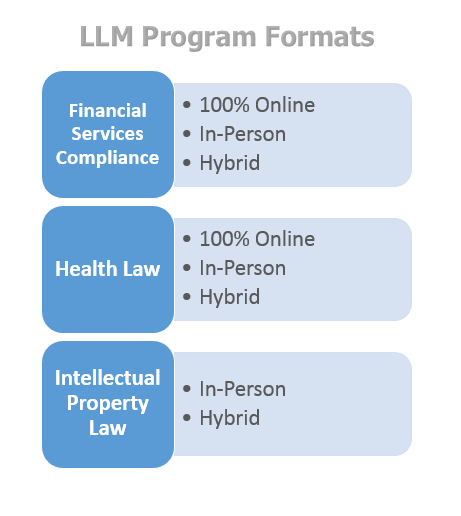 It is possible for students to combine courses from the Health and the IP LLM curricula. In making its selections, the LLM admissions committee will consider depth of practice experience, quality of law school academic record, demonstrated interest in intellectual property law, and evidenced ability to do superior academic work. In most cases, we highly recommend that a candidate have at least two or three years of practice experience, beyond a judicial clerkship, before commencing the graduate program. Maintenance of a GPA of at least 3.0. The graduate student’s faculty advisor will aid the student in selecting electives appropriate to the student's subspecialty. No credits can be applied from a JD program to the Seton Hall LLM Program, but a student who has taken similar courses in his/her JD program may be excused from taking courses that would otherwise be required for the LLM. LLM students are encouraged to complete the degree within two years of commencing enrollment in the program, but they have up to six years to do so. In most cases, the LLM student will convert his or her seminar paper into the Master's Thesis. This will enable the student to spend two semesters of concentrated effort on the topic, presumably under the direction of the seminar teacher, who would continue the supervisory responsibilities through the second semester. Only full-time faculty serve as thesis supervisors. The LLM seminar paper must be a scholarly paper of publishable Law Review quality, of at least 25 pages in length. This seminar involves an in-depth look at certain areas of the entertainment and media industry introduced in the survey course such as television, music licensing and publishing as well as an in-depth look at areas not dealt with in the survey course, such as independent film production, news gathering, advertising, video games, character licensing, and gambling. Assigned reading, class discussion and presentations by various specialists will be used to explore current legal issues, legislation and litigation. In particular, it would examine artists’ rights, such as copyright, moral rights, resale rights and First Amendment rights, as well as the law governing the artist-dealer relationship, auctions and private sales. The course would also discuss the law and practice governing artists’ foundations, estates and museums. It would then examine questions of authenticity in art, and the (sometimes limited) ability of law to aid in resolving disputes about such issues. A significant portion of the class would be spent on the law governing reparations for the wartime plunder and theft of art, as well as on the international trade of art and the national and international law of cultural property (antiquities). This course will examine the developing field of "Cybersecurity" law. "Cybersecurity" refers to technological, social, and legal controls implemented by government and private entities to secure electronic communications and data networks from manipulation, theft and attack by enemies of the state, terrorists, hackers, competitors, and other adversaries. The course will examine these issues from the perspectives of economic regulatory policy, unfair competition and trade secret law, criminal law, constitutional law and civil liberties law, and public international law. This seminar examines the foundations and policies underlying intellectual property law. It considers how and why patent, trademark, and copyright law are similar to and different from one another, the reasons for protecting exclusive rights to intangible creations, and when the public should have unrestricted access to inventions, artistic creations, and source-indicating symbols. The focus is on completing an AWR paper on any intellectual property topic related to patent, trademark, or copyright. The course is a comprehensive study of the law relating to gaming activities with an emphasis on the laws, policies, and procedures that have developed through court decisions and the regulatory activities of the administrative agencies. In addition, the course will provide an overview of public policy issues, the federal role in regulation of gaming, the economics of gaming, the creation of gaming control systems, the licensing process, gaming contracts and gaming crimes. The course will also explore the nature of the eveil sought to be addressed in gaming laws and regulations, will examine the leading approaches to the regulation of gaming, and will deal with some of the current issues in gaming law. This seminar develops the writing and analytical skills required to draft applications for United States patents. Patent claim drafting skills are not undertaken in this course. Patent prosecution techniques, however, including evaluation of Patent and Trademark Office Official Actions and preparation of responses to these Official Actions are studied. There also is practice in drafting appellate briefs for submission to the Board of Patent Appeals and Interferences. This drafting seminar will focus on the "claim" or "claims" appended to a patent specification. The claim defines the scope of the grant, or the technical extent of the exclusive privilege the patent accords to its owner. Claim drafting assignments will be distributed to the students before each class. Each student's work will be reviewed on an individual basis, with rewriting and revision as needed. A survey of the major topics in sports law. Special attention is given to the regulation of professional and amateur athletics, the organizational structure of sports leagues and associations, labor-management relations, international sports regulatory agencies, individual rights of athletes and spectators, and the application of tort and criminal law principles to sports. This course is designed for law students with an interest in the interrelationship of American sports and the legal system and not exclusively for those interested in careers as sports lawyers. Federal registration provides important benefits to trademark owners, including corporations. Trademarks are among a company’s most valuable assets. Registration work is a staple of many law firm and in-house intellectual property practices. This class will cover the basics of domestic and international trademark registration practice, from selection of a mark and legal screening/clearance through opposition proceedings, registration, and beyond. Hands on, practical use of the USPTO website for filings and research will be explored. Assignments will include hands on drafting of opinion letters, registration papers, and pleadings drawn from real-world examples. * Students may take up to 2 elective courses from another concentration area. LLM students must remain in good academic standing throughout the program. View the full academic policy. Each student is given an exam number. In addition to using his or her exam number, each student should indicate on the front of his/her exam that he/she is an LLM candidate. This allows professors to exclude graduate students from the mandatory J.D. grading curve. No other reference to identity should be indicated on the exam. Every effort to maintain a student’s anonymity will be made; however, anonymity may sometimes be compromised due to the small number of graduate students enrolled in a given class.